There are a lot of apps/websites out there that claim to make or save you money. These are the 21 best that I use and would recommend. I was able to make/save an extra $1200 last year! I definitely recommend getting a PayPal account as most of the apps will let you choose between a gift card or payment to PayPal. Gift cards are great but if you are looking to save for Christmas, a vacation, or pay down debt the cash may be more useful than a Starbucks gift card. Although I certainly use the apps at times to feed my Starbucks addiction! Make sure to always cash out as soon as you can, there’s always the possibility of getting deactivated or the app shutting down and you don’t want to lose out on your earnings. To maximize your savings use multiple apps as you may be able to save on one item in multiple ways. This article contains affiliate links. 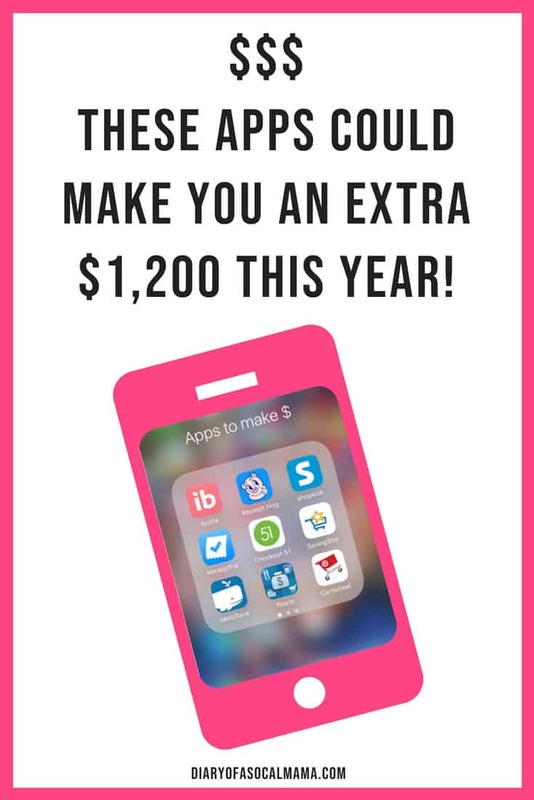 I personally use all of these apps and want you to save like I do! Some may offer me a small incentive for referring you to the program. All of these apps are available for download through your app store. I do have an iPhone, but I believe most if not all of these are also available for Android devices. Swagbucks tops this list. You can earn points by watching videos, taking surveys, and doing special offers. Use the points to cash out for gift cards or to your pay pal account. While this is mainly a website there are apps involved and you can do a lot on mobile. 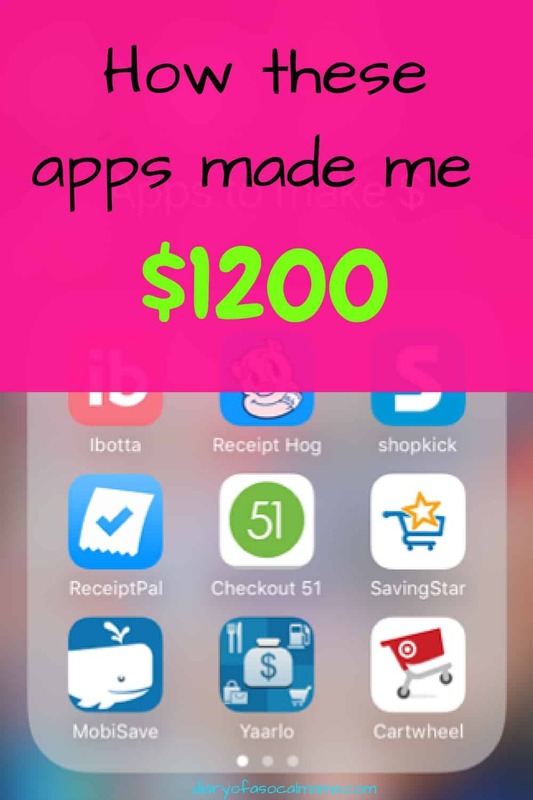 MobiSave isn’t the biggest money maker but it’s one of my favorites because it pays out instantly to your PayPal account, there’s no waiting to hit a certain threshold before receiving funds. Select grocery offers and then after purchasing the products you’ll need to scan your receipt to get the reward. The app resets every Monday so make sure you scan your grocery receipt right away if you go shopping on a Sunday. Ibotta is another grocery shopping app and one of the easiest to use. Make sure you activate offers before you shop. There are also many different bonuses they run so make sure to check the bonuses tab to see the current offers. Offers are valid at certain stores and only until a certain date so be sure to check the stores and expiration dates before you shop. You can cash out once you reach a $20 threshold for a gift card or to your PayPal account. Checkout 51 will also help you save on groceries. The offers reset every Thursday so be sure you scan any receipt before then. You will need to go on ahead of time and activate offers you are interested in. I generally just check it on Thursday mornings. Some offers are limited to specific stores so do watch out for those. Cash out once you reach the $20 threshold. 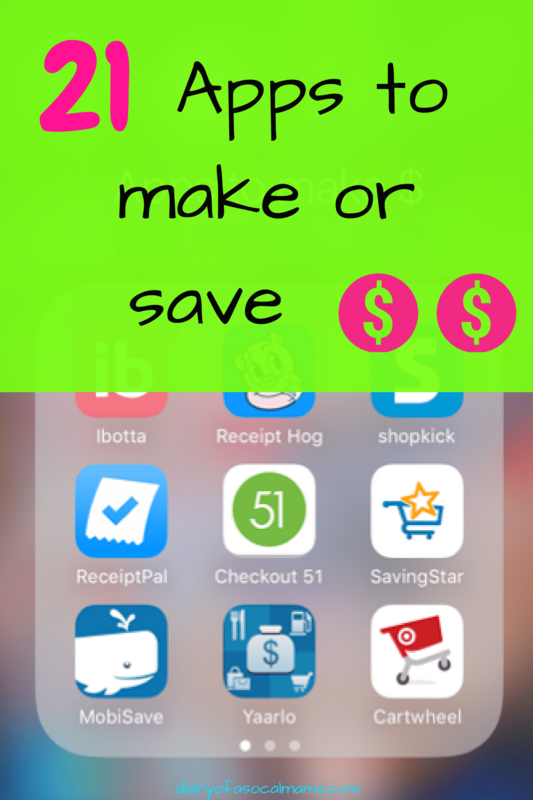 SavingStar is another option to save on groceries. Activate offers before you head to the store. Some stores require you to register your loyalty card instead of scanning the receipt (like CVS). Click on the redeem tab in the app to see how to get credit for offers at various stores. What’s nice about this app is you only need to meet a $5 threshold to cash out…but it has fewer offers. Bonus Tip: Apps can be glitchy or you can unknowingly break some rule and get your account shut down or emptied. Always cash out as soon as you hit the payout threshold! I’ve seen plenty of people lose all the money in their account by holding out to cash out at a high amount. Take your money as soon as you can to avoid this happening to you! MileUp is great as it rewards you for something you already do anyway…driving! You might as well make all those miles going to the store, mommy groups, doctor appointments, and team practices count. MileUp tracks how many miles you drive and you earn points accordingly. The points are split between being redeemable for sweepstakes and for gift cards. You do need to open the app and join challenges in order to earn bonus points. But it’s mostly an app you can get and forget, just check in every now and then to redeem your points. You can redeem for gift cards starting at 4,000 points to places like Amazon, Target, & iTunes. ReceiptPal is one of my favorite of the receipt scanning apps. Simply take a photo of any receipt and you earn 100 points for every 4 receipts you submit. You can also submit receipts you receive via email by forwarding them to them from your registered email address. The downside is you can’t redeem to PayPal, but there’s always Amazon. Redeem for $1 Amazon credit at as little as 400 points or save those points for a higher payout. This is another app that will pay you to scan receipts. It’s fun in that you can also earn slot machine spins for submitting on a regular basis. Those spins can sometimes earn you extra points. Redeem for PayPal or Amazon.com credit when you reach 1000 coins or more. Yaarlo is one of the newer receipt apps and I have yet to redeem for a reward. However, it’s another one that’s easy to use as all you have to do is scan your receipts once your done shopping, eating out, etc. The points do add up slowly so it can take some time to earn a reward…I’m still working towards that first payout. Shopkick is a very simple app…simply open it as you walk into a store and earn points they call kicks. Before life got crazy with an infant I also used to earn points by scanning items. The app will tell you which items to scan and sometimes after you scan there will be a few questions to answer. Earn even more if you purchase certain items and scan your receipt as proof. Link your credit card and you can also earn kick for purchases at some stores, recently they’ve been offering bonus kicks for shopping at Carter’s!…as if I needed another incentive to buy baby clothes. The kicks for dollar spent varies by store. Redeem for gift cards starting at 500 kicks. I usually use this app to redeem for Starbucks gift cards. It’s a pretty easy way to earn a free coffee. Fetch Rewards is a newer app but as of now the points are adding up fast. You’ll earn points if you purchase certain items…but you don’t have to activate anything ahead of time making it easier than some other grocery apps. Redeem starting at 3,000 points to a large variety of stores including Amazon, Target, & Walmart. Use code M1WJU during signup and you’ll get 1,500 points to get you started. Panel app is another that rewards you for letting it track your location. You can also earn extra points by answering short surveys that will ask you to confirm if you were at certain locations. Redeem starting at 1,000 points. Redemption offers are for Amazon, Visa gift cards, & Walmart gift cards. Find&Save is no longer one of my favorites but you can save if you shop at the right stores. (They used to offer rebates at places like Vons but not any more so I don’t make as much). You have to check it frequently as the store offers change and there are new ones up almost every day. Each offer is generally good for 3-7 days. Activate the offer, shop, and then scan your receipt to get money back. Offers include a wide variety of stores and restaurants. When you hit $25 they will pay you via PayPal. You will need a PayPal account in order to receive a payment. Achievement is another one of these apps that will pay you for doing what you’re already doing…moving. Link it your Apple fitness monitor, Fitbit app, etc and you will earn points for walking or even sleeping! Just check it every so often to make sure it’s still synced to your apps. The points accrue slowly but it’s mostly a set it and forget it money maker. The Cartwheel App is Target’s savings app. Add items before you shop and then scan your barcode at checkout to get special discounts. You can even scan items in the store to see if there are any cartwheel offers on that item. If you want to save even more at Target click the link below to sign up for a Target Redcard. Choose the Debit card option and it links directly to your debit card so no worries about paying interest! Earn cash lets you earn points for completing tasks, mostly downloading mobile apps. Generally, all you have to do is download and open the app to get the points. Once you get the points you can delete the app if you aren’t interested. Some will require you to complete the tutorial or get to a certain level. If you have older kids it might be a great way for them to try out new games and for you to earn points! Paribus will look at your receipts and check for price drops. You do have to give them access to your email account so they can look for receipts. If a price drops during the store’s price match window they will contact them on your behalf to get you money back. They will take a percentage of the amount you get back in return for their work…but who has time to check on everything they buy?! Ebates offers cash back when you shop at certain stores and will then send you a quarterly rebate check. Use the app to save when you are shopping through your phone. Also, sometimes the app and the website have different cash back percentages so it never hurts to check both. On the Walmart App is a button that says Savings Catcher. After you shop at Walmart scan your receipt using the Savings Catcher and they will check other ads in the area and provide you a rebate via a Walmart gift card if another store is advertising a lower price on an item you purchased. An easy way to ensure you’re getting the best price. Here’s another way to get paid for moving. With this one, you will need to link it to another app on your phone like Fitbit or the Apple Health app. Earn points for walking that you can then spend in store along with any other balance rewards points you earn in store on purchases. Set it up and forget it…just don’t forget to use the points! Last but not least on this list is BevRAGE. BevRAGE is essentially Ibotta for alcohol. If you buy booze at the store you need this app to save you money…and everyone needs that since liquor is expensive. Redeem via PayPal to receive your cash faster. Want to know how to save money when you shop online? Check out my tips and tricks here.